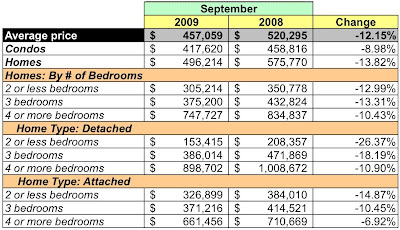 MRIS released its data for September signed sales contracts for existing home and condos in the District a few days ago. As in its August [and July and June and May] report, sales and dollar volume are up and prices are lower than the same period last year. More is selling, but for less. Plus ça change... Before we get excited and go shopping, remember that we're now into the one year anniversary of the financial collapse kindly brought to us by the Bagatelle brunching idiots who work on Wall Street. So it ain't as good as it looks. Sales volume was robust, increasing 34.96% YoY. Condos and homes both shared in the positive growth, increasing 41.75% and 28.84%, respectively. Prices continue their tale of woe. Average prices fell 12.15%. Condo prices fell 8.98%, while home prices dropped 13.82%. As in August, not a single home category experienced higher prices YoY. 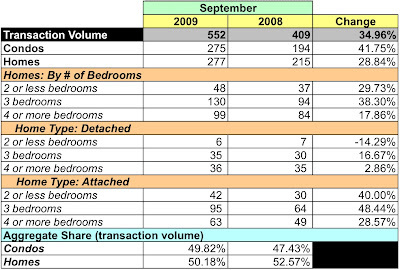 At September's sales rate, there is a 5.35 month's supply of condo units on the market, 8.82% more than August. For homes, 6.39 months, 15.9% more. Amazing that it's been a whole year.